With the Baby Boomer generation getting older, many people who have lived at the same home for 20+ years are realizing a very important fact; you can’t eat equity. People who have spent years maintaining and updating their home are in a position where they have a large amount of equity in their property. But that equity is not helping with monthly bills such as car repairs, home insurance or medical issues. It is for this reason that the reverse mortgage was created. Unlike a traditional mortgage, where the borrower makes monthly payments to pay down a balance, the borrower will receive money from the lender. The payments from the lender will continue until the maximum loan amount is reached. People typically use this new source of income as a way to pay medical bills, pay down other debt and other necessary expenses. When the reverse mortgage program was originally introduced in the late 90’s, the requirements were quite simple. Anybody over the age of 65 could get approved. Regardless of the person’s income, debt or any other criteria, so long as the person currently lived in the home and had significant equity, they could get approved. By 2012, there were thousands of people who had went in default of the reverse mortgage. For this very reason, 2 major changes were put in place. The first change was to limit the lump sum payout. Beginning October 2017, the amount that any borrower may receive as a lump sum has been drastically reduced. The reasoning behind this change was to stop homeowners from using all of their equity in the event they wished to remain in the home after the loan was completed or wanted to sell the property to move to a new location. The second change comes in the form of fees. Each new reverse mortgage closed on or after October 2, 2017 will be assessed a 2% Mortgage Insurance Premium. This amount is applied at closing to the Maximum Claim Amount (MCA). A yearly fee equal to 0.5% of the outstanding balance will also be assessed. Thirdly, there is now a financial counseling requirement. Counselors will show potential borrowers the pros and cons of getting a reverse mortgage as well as alternatives to the loan. The counselor will also offer detailed information for how the loan is to be repaid and when it is repaid. The counseling is designed to give borrowers a complete picture of their financial future before taking on a reverse mortgage. Before obtaining the loan, the lender will go through some basic financial guidelines for the borrower. First, it will be determined that the borrower currently has sufficient funds to cover their basic living expenses. Secondly, the lender will verify that the annual home owner’s insurance policy has been paid on time as well as the annual property taxes. Borrowers may choose to have either a fixed rate mortgage or an adjustable rate mortgage. For the fixed rate mortgage, the borrower will receive the funds as a single lump. Term payments – borrower will receive equal amount of payments each month for a specified number of months. There is one other limiting factor on the dollar amount of the mortgage. FHA does not loan out more than $679,650 for a reverse mortgage. Borrowers have the choice of paying the loan costs from their own funds or using the loan to pay for the costs. Using the loan means that the borrower will receive less money in their payments. Mortgage Insurance – FHA will require mortgage insurance in two forms. There will be a funding fee paid at time of closing along with an annual fee paid each year that the mortgage is in place. This fee is put in place to guarantee that borrowers will receive their funds. Charges from other contractors – The mortgage will likely require an appraisal as well as title insurance and other common charges. Servicing fee – When the loan is initiated a servicing account will be set up. This account makes sure the annual property taxes and home owner’s insurance are paid. There will be a fee to set up the account as well as a monthly fee for the service. With a typical mortgage, the borrower will sign a lot of papers and money will change hands. In the case of a purchase, the seller of the home will get the money while the borrowers will get the keys to the home. Then, the borrowers begin making monthly payments until the loan is paid off. The borrower(s) moves out of the home for 6 months or greater and/or no longer lives there as their primary residence. Until one of those criteria are met, the borrower(s) are welcome to stay in the property, even if they have received all the funds. Listed below are some common questions people have about these special loans along with explanations of the answers. Is it possible to apply for the reverse mortgage even if my current mortgage is not insured by FHA? Yes, you may apply for the reverse mortgage regardless of what type of loan you may currently have in place on your home. How does the reverse mortgage differ from a home equity line of credit? A home equity line of credit is a loan that requires the borrower to repay the loan at some point in the future. In addition, the borrower must make monthly payments towards the loan. 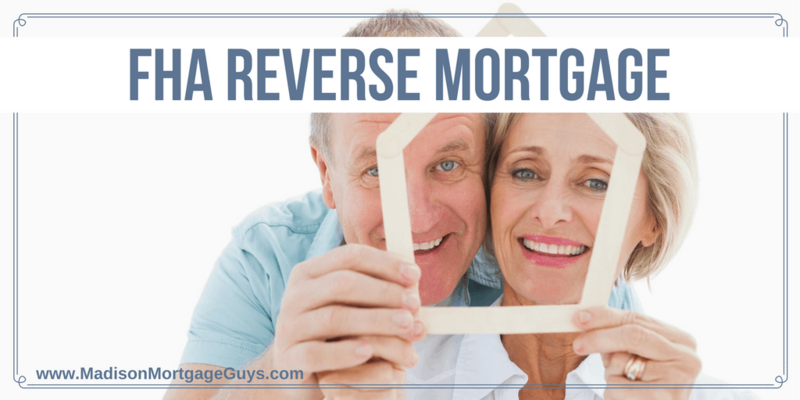 With a reverse mortgage, the borrower is receiving money but not required to make any payments. The loan only must be repaid when the borrower moves out of the home or passes away. Will we be able to pass our estate on to our heirs? When the borrower moves out of the home or passes away, the loan must be repaid. Typically, the home is sold to repay the debt. Any amount left from the sale of the home after paying back the reverse mortgage can be disbursed to heirs. What if I change my mind and no longer wish to have a reverse mortgage? According to federal law, once a borrower signs the loan documents for a reverse mortgage, they have 3 business days to change their mind. If the 3 days pass and the borrower choose to keep the loan, they must repay any used portion of the loan in order to be released from the responsibility of paying the mortgage. This is why FHA now requires the counseling session. It is important that all borrowers understand their financial responsibility once they receive a reverse mortgage. Since the reverse mortgage is adding to the borrower’s monthly income, there are wide ranges of ways to use the loan. Here are some of the most popular uses. Improved quality of life – with extra income, the senior borrower may be able to afford dining out a bit more often, or taking a vacation, or other luxuries. Helping with monthly obligations – the extra money can also be used to pay for basic necessities such as utility bills, groceries, home insurance, life insurance, automobile maintenance, or any other type of recurring bill. At home personal care – another common occurrence for the elderly is the need for professional at-home care from private health providers. Reverse mortgage funds can certainly be used to help with these expenses as well. When used responsibly, the reverse mortgage can be a wonderful boost for senior citizens. The ability to tap in to their home’s equity without the requirement for making any payments is a very unique type of loan and can be very useful.